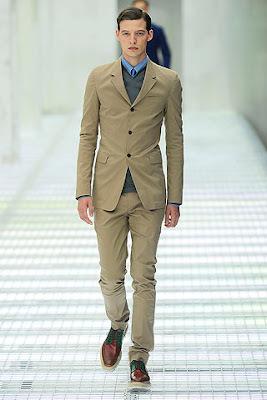 Continuing on from my previous two posts of first impressions from the Spring 2011 collections at Milan here are a few more looks that took my interest. 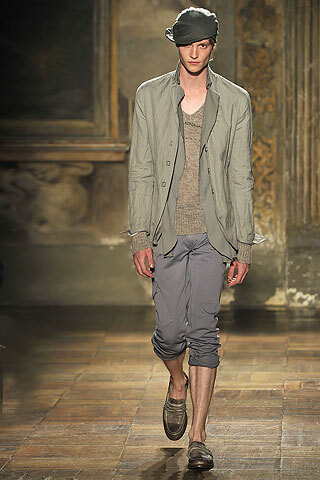 There is still one collection from Milan that I would like to write a proper review of, as well as a few from Paris that were certainly interesting. I may do a similar first impressions for Paris, however I may just try to condense it into one post so that I can take the time to write up some proper reviews to go with. 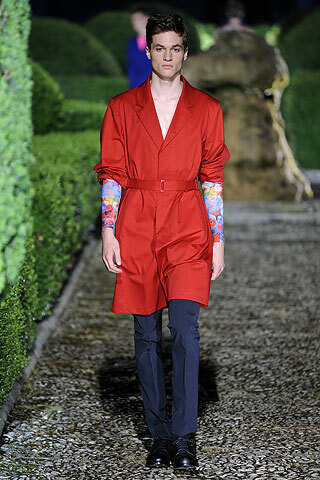 The Jil Sander collection was certainly not for the faint of heart - bright colours cascaded down the runway in a joyful abundance. As you well know I am ever so slightly a fan of bright colours, and this collection had me well covered in that respect. The coupling of colours was bold and unapologetic, with the typically minimalist designs allowing that colour to really draw attention to the cuts. Alongside the simple colour blocking looks were intriguing striped patterns and even some vividly imagined florals. Whilst the colours and patterns stood out, a small part of me still wanted to see something more interesting in terms of cut and construction. The sleek and slim cuts were well done, however at times it seemed that there was perhaps not quite enough behind the flair of strong colours to make individual pieces stand out. That being said however there were elements alongside the bright colours that took my fancy. The first was the styling of the printed floral sleeves worn underneath the red trench, which had a partner in a skintight long sleeve top worn beneath a bright blue trench. A far more interesting (and not to mention tasteful) alternative to those rather crude faux tattoo sleeves one often finds, they provided a nice finishing touch. I would be rather interested in seeing them in a more conservative look, treated more like the colourful silk lining of a suit. Perhaps peeking out from underneath rolled up sleeves? 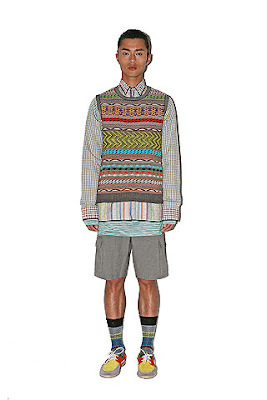 As a layering option it is quite the exciting piece. The second aspect that stood out for me was a particular colour combination. I thought the play of bright yellow, pink and mint green together was fantastic. Whist pairing two bold colours creates an impact of its own, adding that third colour is ostensibly an easy way to amp it up, however it can create yet another pitfall in terms of what colours work well together. Yet by sticking to colours with a similar tonal value, the look really did stand out. Colour blocking can often be a hard look to carry as one really does need to pay attention to how colours work against one's complexion (I find it hard to wear block orange tops for example), however when done right can create very powerful looks. 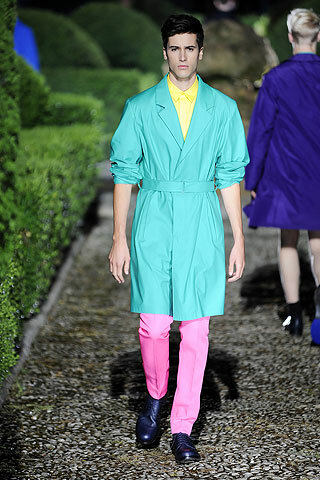 As such the door such play on the runway opens, for more experimentation with colour, is both interesting and exciting. Soft, washed and comfortable. I liked how casual and at ease this look was, perfectly suited to the warmer days of Spring. The combination of the lightweight marled sweater worn beneath the double lined deconstructed jacket gave the look a soft and inviting appeal. The muted colour palette really did work to its advantage, and I liked the contrast in tones between the interior and exterior of the jacket. The construction of the jacket provided the illusion of greater layering in the look, however it was lightweight and open. I also really liked the rolled up flat fronted grey trousers. I would never wear shorts that come below the knee (actually I rarely wear shorts thanks my freakishly thin legs), however I have always found the look of trousers rolled up to below the knee rather appealing. It gives a sense of that casual elegance which is so alluring to embody. The finishing touches of the soft cloth cap and faded leather loafers added to the rather sun bleached and worn appeal of the look. Missoni killed it with the knitwear. Absolutely spectacular. This sweater vest, and the matching cardigan, were my favourite. Thom Browne may be a runner at heart, but he sure can make a collection for fashion conscious cyclists. I have to admit that I do not actually know how to ride a bicycle, but this collection makes me want to get on one and give it a go. A rather simple yet highly functional look, it is the details that makes this look work so well. The colour combination of pink, grey and tan may not be particularly revolutionary (indeed one of my standby outfits is a pink oxford shirt, grey sweater, tan corduroys, pink socks and brown loafers), however upon second glance the look really does stand out. Note the sporty pink zip top that seems perfect for cycling or running. Equally the cropped tan trousers are perfectly functional, not simply mimicking the part of sportswear. 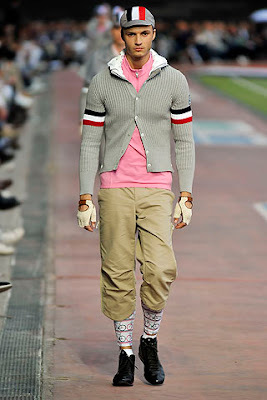 I enjoyed the ribbed grey cardigan, especially the addition of the removable white hood. Indeed functionality has always been what makes Moncler stand apart, and through Browne's vision it is functionality with style. His sportswear looks are almost nostalgic in their realization. Note the styling of the cap and the driving (well cycling I suppose) gloves. I also really enjoyed the addition of the cycle print leggings throughout the collection. They make those plain black Lycra leggings most cyclists wear look positively dour. 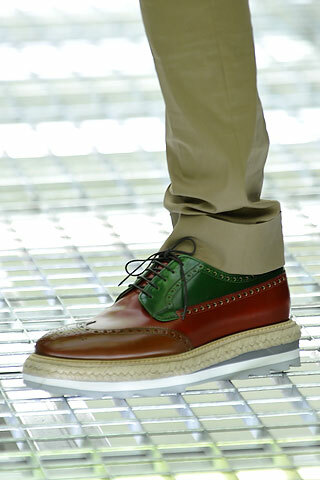 Junya Watanabe x Trickers eat your heart out, the shoes at Prada were sensational. The sharp tailoring also had its allure, and I must admit that I am oddly drawn to the idea of wearing three button suits again. Fashion forward? No, not even remotely. 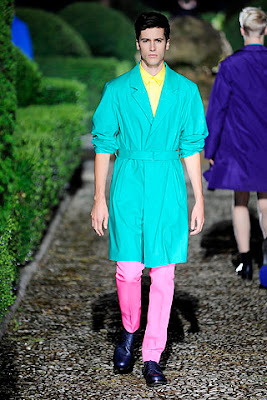 However for me this was one of the best looks from all of the Milan shows. Traditional, classic, even conservative, it harked back to an idealized past which paves the way for a better future. It is what Westwood once described her own work as - "nostalgia for the future" - in full effect. Love it. 3. who is keeping the 'around the world' book hostage? I feel happy to see the introdution of some bright colours. I like the John Varvatos. It's so very comfortable looking. I'm not sure about that one sweater..but, I love most of it. wow, so comfy. I hope.